Designed and custom built for the education sector, particularly for pupils aged 11 years to adults. This Minibus is highly suited to 6th form, College, University, Student Union or Charity use. The CanDrive Maxi 17 Seater is IVA tested and has maximum space and maximum payload. It may be driven on a standard B driving licence, meaning no expensive and time consuming D1 licence training required (conditions apply*). New vehicles can be first registered as a minibus for schools and charities. To upgrade from the standard base model to a lux model costs £500. Inclusive of integrated touch screen sat nav, c/d player, electric folding mirrors and air conditioning. 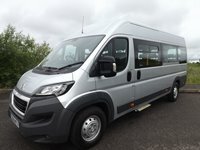 Purchase this Peugeot Boxer Minibus from £25,495 + VAT or lease from as little as £14 + VAT per day over 5 years. Still wondering whether to buy or lease a new minibus? Our unique Try Before You Buy and Try Before You Lease deals let your establishment experience a minibus for up to 6 months, with no long-term commitment or obligation.